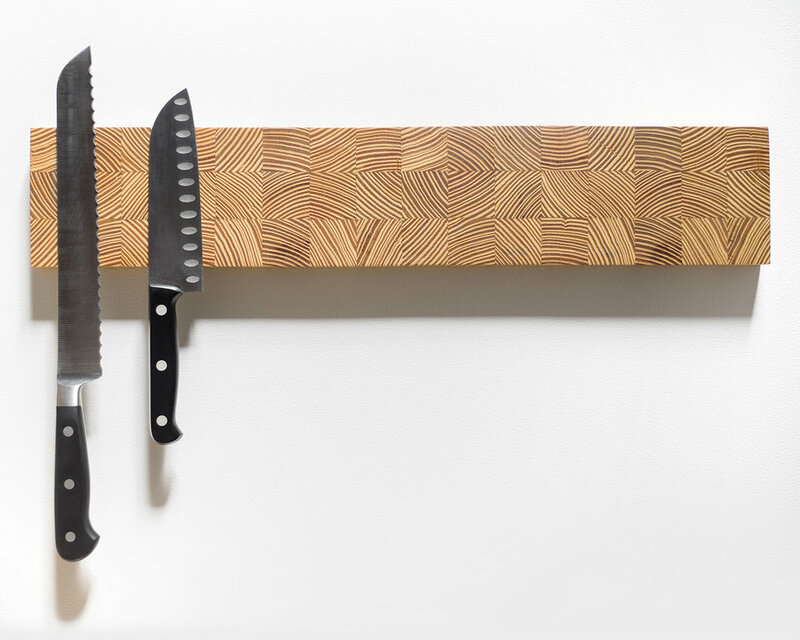 End-grain magnetic knife holder made with various types of wood in detailed pattern. Holds 7 knives with neodymium magnets. Finished with a durable urethane. Secures to wall using 2 keyholes. 16.5 x 3 x 1.75"
End-grain magnetic knife holder made with Southern Yellow Pine. 18 x 3.75 x 1"
Magnetic knife holder made of Walnut, with various wood polka-dot inlays. Holds 8 knives with neodymium magnets. Finished with a durable urethane. End-grain magnetic knife holder made of Walnut. Holds 6 knives with neodymium magnets. Finished with a durable urethane. 15.5 x 3 x 1"
French style rolling pins made of solid hardwood. Finished with mineral oil and buffed with beeswax. Crocheted Trivet made with cotton rope, featuring handle and various colored tassels. Salt + Pepper shakers made from Southern Yellow Pine and Walnut. approx: 5.5 x 4.5 x 3"